It is a product containing microscopic worms (nematodes) which are natural predators of ants. The ants do not tolerate the nematodes near their nests and move their nests away from these areas. -Apply directly on to the nests and water well after application for at least 2 weeks. -It is safe to use and harmless to children, pets, birds and wildlife. -This pack fills up to 8 watering cans and treats up to 16 nests in soil. 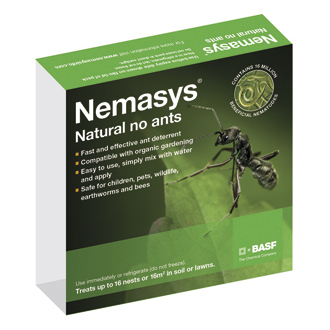 All Nemasys products contain Nematodes (microscopic worms) which are renowned biological control products, providing many benefits over traditional gardening chemicals and are a key ally for organic gardeners. All products are simple to apply, and totally safe to use and harmless to children, pets, birds and wildlife. PLEASE NOTE: This is a live product and needs to be used upon receipt. Use entire packet at one time and do not store made up solution.